As more business moves into the South Lake Union neighborhood services are also starting to move in. The Dahlia Workshop is one of the restaurants that has recently opened. It has a bit of a split personality – but I mean that in a good way. In the morning they serve breakfast biscuits, at lunch they add a soup and salad option. In the afternoon they morph into a little snack bar with a (mini) biscuit happy hour, various savory snacks and serve wine and beer. They are working on upgrading to a full liquor license and when that happens (maybe later this summer?) expect to see more changes as they expand their evening offerings. In the meantime, their morning biscuits are delicious! 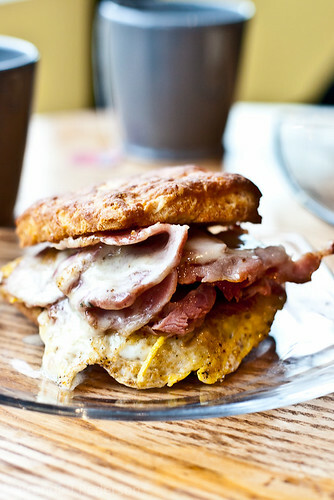 My favorite combines workshop ham, an egg, a little cheddar cheese and an amazing apple mustard. And I keep thinking I should go for the basic biscuit, butter and jam. You can’t be in a huge hurry – this isn’t fast food – but you can pretty easily get in and out in 15 to 20 minutes, including your eating time. There are a few tables inside and it’s never been crowded when I’ve visited. Most of the biscuit sandwiches are also suitable “to go”. The two with gravy are probably best eaten on site, however. Now that warm weather is headed our way, this would be a nice place to sit at one of the outdoor tables and start the day with biscuits and sunshine.